When something unexpected happens, it can be difficult to see the good in the situation. It is human nature to want to try to control every aspect of our lives, but God often has a different plan for us than we have for ourselves. At these times, we strive to remember that God’s timing is never wrong and to accept the unexpected. This was the case for Lydia. * Lydia came to one of our centers with her aunt and her boyfriend. Her aunt told a peer counselor that she was afraid her niece was considering abortion. 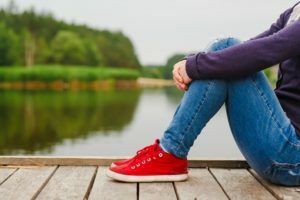 After Lydia started talking with the peer counselor, she confirmed that she did want to abort because she had just moved here from Puerto Rice to finish school. She mentioned if she did abort, it would be with the pill. Lydia was starting classes this fall and didn’t want a baby to interrupt or prevent her from going to school. After all, Lydia had moved to the United States to fulfill her dreams. It was hard for Lydia to see past the situation she was currently in. In her mind, having a baby and attending school at the same time wasn’t possible. During the counseling session, the peer counselor reviewed materials with Lydia on all of her options. When the counselor asked Lydia if she thought her boyfriend would want to abort the baby, Lydia said he would not agree. Lydia started to cry, telling the peer counselor that she was a believer in Jesus Christ and she knew it would be wrong to abort her baby. They went over a resource list so Lydia could see that there were people who were willing to help her and her baby if she decided to carry her child. When the session was coming to an end, the peer counselor asked Lydia if abortion was still an option, and Lydia said no. She requested her boyfriend come back to the counseling room so she could tell him that she was pregnant. He was so excited and was very pleased to hear that abortion was not an option for Lydia anymore. Lydia is still going to attend classes this fall. Even during the unexpected, God can make a way. It can be so hard for us to see that sometimes, and that is why it is so important to surround ourselves with and talk to other Christians who can help us see the path God is creating for us.